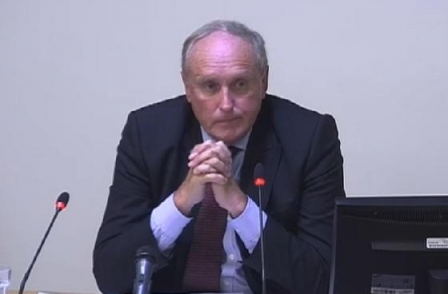 One-time Conservative Minister and MP Tim Yeo is being investigated by police following his defeat in his defamation claim against the Sunday Times. The former South Suffolk MP claimed that the newspaper defamed him with two articles published on 9 June, 2013, following a meeting he has with undercover journalists Jonathan Calvert and Heidi Blake, and a third, which appeared on 23 June. During the meeting the two journalists discussed with Yeo the possibility of his becoming a paid advocate for a South Korean energy firm – which would have been a breach of the House of Commons Code of Conduct. The Metropolitan Police confirmed yesterday that an investigation was being launched. A spokeswoman said: "An email has been received by the Metropolitan Police's Special Enquiry Team. Its contents are being assessed." Reports said that the investigation followed a complaint by a Dave Davies, an environmental campaigner and long-standing critic of Yeo, who sent the force an email asking it to investigate the former MP for perjury. Yeo brought the case on a no-win, no-fee conditional fee agreement, meaning that the insurers who issued the policy covering his costs now face paying Times Newspapers Ltd some £500,000 in costs. The Sunday Times said immediately after the decision was handed down that Yeo had agreed to pay Times Newspapers £411,000 on account of its legal fees within 28 days, and that any further costs would be assessed on the indemnity basis. Yeo's counsel, Desmond Browne QC, had told the court at the start of the seven-day trial on October 12 that the Sunday Times had "trashed" the reputation of the 70-year-old politician, who stood down at the last general election after a 32-year Parliamentary career. The newspaper, he said, had acted in numerous respects "with a singular lack of responsibility both at the journalistic and the editorial level". The trial judge, Mr Justice Warby, upheld the newspaper's defences – Reynolds privilege for responsible journalism on a matter of public interest, justification, and honest comment – in a decision handed down on 25 November. He also savaged Yeo, describing his evidence variously as "false and, in my judgment, dishonest"; "not credible"; "implausible"; and "clearly untrue and close to absurd". The judge said his assessment of Yeo's credibility as a witness was a key factor in deciding whether the newspaper had justified its allegations on the balance of probabilities. "As to plausibility, some of what Mr Yeo said was plausible on its face. "But by no means all of it was. Indeed, I found some of his evidence utterly implausible. I refer in particular to his evidence about what he understood to be on offer to him, via the -mail and at the meeting." He was, he said, "quite unable" to accept Yeo's evidence that he had forgotten about the pay being offered in the email suggesting the meeting at the restaurant. He went on: "I accept that Mr Yeo is genuinely interested in green technology, and that he has given advice and help to some in this field without seeking or accepting any material reward. "However, the 13 May email was short and clear. It was plainly suggesting a consultancy with generous remuneration. It is not credible that this was not present to Mr Yeo's mind at all. "Experience suggests that in general those who are not interested in money tend not to get much. I can think of none who convincingly claim to have no interest in money, yet end up with an annual income in excess of £200,000. I do not consider that Yeo is such a person. In my judgment this evidence was untrue. I am not persuaded that it was honest either." On occasion, and when under pressure, Yeo had resorted to "answers involving bluster, not only in their content but also in his manner", Justice Warby went on. "In my judgment Mr Yeo went to the meeting knowing full well that its purpose was to discuss the prospect of a consultancy, involving work for which the client was prepared to pay generously. "That prospect was not the only reason he went to the lunch, but it was very much present to his mind." The session was a preliminary meeting, the judge said, adding: "The important point is what the meeting was preliminary to. To a man as intelligent as Mr Yeo that cannot have been in doubt. It was preliminary to a job, for payment. The way that he responded to questions shows that he was not in doubt about this." "His case is that his references to 'getting value' and the prospect of negotiation amounted to a suggestion that he might not earn as much as £7,000 a month, in which case he would take less. I am not convinced by that. "The more likely interpretation is that of Times Newspapers Ltd: that he was keeping open the option to negotiate upwards. Certainly, Mr Yeo was not baulking here at the suggestion that he might earn thousands a month from this consultancy. He was not offering to do the work for nothing. It is noteworthy that he did not quibble when the topic of a bonus was raised."